Text by Miriam Mann Harris, daughter of Miriam D. Mann. Rights held by Mann family. Text by Miriam Mann Harris, daughter of Miriam D. Mann. 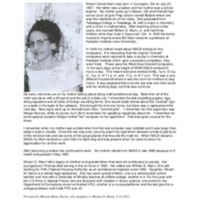 , “Biography of Miriam D. Mann,” Human Computers at NASA, accessed April 19, 2019, http://omeka.macalester.edu/humancomputerproject/items/show/34.